Here is an insightful compilation of contributions from scientists, healthcare experts, and doctors working actively to bring about wholesome healing to individuals, looking at cuttingedge holistic therapies. 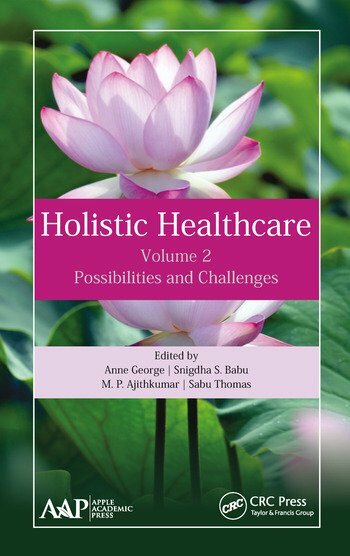 It includes chapters that deal with improving the general health of people from various walks of life, to treating some very challenging diseases. Various schools of treatments, exercise regimes, and meditations are discussed. Specific topics include the use of alternative therapy for human health and healing, including yoga, meditation, acupuncture, prayer, herbs, Ayurvedic treatment, and homoeopathy. The volume showcases some recent trends in treating various diseases that plague mankind, including superbugs, drug sideeffects, drug abuse, and myriad lifestyle-related diseases and syndromes. Role of Herbs in Pharmacotherapy of Depression Ginpreet Kaur et al. Medical Emergency Response Services in the State of Kerala: Evaluation Report Binoy S. Babu et al. Anne George, MD, MBBS, DGO, Dip Acupuncture, is an Associate Professor in the Department of Anatomy at the Government Medical College, Kottayam, Kerala, India. She has worked in several international labs, including the laboratories at Laval University, Quebec, Canada; Faculty of Medicine, University of Vienna, Austria; and the Department of Immunology, Katholieke University of Leuven, Belgium. Dr. George has edited many books and published research articles and reviews in international journals and has presented many papers at international conferences. Snigdha Sajeendra Babu is pursuing her PhD at the International and Inter University Centre for Nanoscience and Nanotechnology, Mahatma Gandhi University, India. She has research experience in the field of biotechnology, polymer science, and nanotechnology. Her specialization is in microbiological applications of nanomaterials. Ajithkumar, PhD, is a postdoctoral fellow at the International and Inter University Centre for Nanoscience and Nanotechnology, Mahatma Gandhi University, India. He has more than eight years of research experience in the area of chemistry and is an expert in polymer synthesis and materials chemistry. His current research is focused on developing carbon dots and graphene materials for imaging, sensing, and energy applications. Sabu Thomas, PhD, is the Pro-Vice Chancellor of Mahatma Gandhi University and Founding Director of the International and Inter University Center for Nanoscience and Nanotechnology, Mahatma Gandhi University, India. He is also a full professor of polymer science and engineering at the School of Chemical Sciences of the same university. A prolific author, Professor Thomas has published over 750 peer-reviewed research papers, reviews, and book chapters and has a citation count of 31,574. The H index of Prof. Thomas is 81, and he has six patents to his credit.